* The United Scents of America aim to represent each state with their own unique scent. * For New Jersey, it’s all about the Jersey Shore boardwalk and amusement parks – kicking off with buttery popcorn and sweets. * The scent is very realistic and nearly edible. * The popcorn and sweets meld to become a mix of cotton candy and Cracker Jacks. Sometimes a coconut note is present as well. * The amusement park smell lasts about three hours before calming down to a sweet vanilla and patchouli blend. 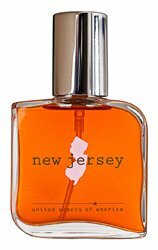 Summary: If you want to smell like an amusement park (in a good way), New Jersey is for you. Priced under $60, its a relatively cheap thrill and while it doesn’t smell like a luxury fragrance – it is definitely fun. I would even venture to say that if Bond No. 9 Coney Island is on your list of favorites, here is a similar scent for one third the price – so it’s definitely worn a sample. Longevity is good for an eau de toilette – lasting about 5 hours on the skin. As you can probably guess, this is a strong gourmand, so if you don’t like sweet, foody smells – stay clear. If you want something light, fun, and easy to wear to remind you of a fun vacation – this take on New Jersey is a fun fragrant trip. Ari gave me a bottle of this about two weeks before the hurricane. All that inspired it is largely gone now. I never thought a perfume that I might have laughed off at any other time would prove so poignant… a relic of my home, interpreted with affection via scent. Thanks for this. OMG. This actually smells like an amusement park? I would totally want that in a candle.